The mountain climbing drama Everest doesn't arrive until next fall, and it's one of our 20 Most Anticipated Movies of 2015. But so far we've only seen one photo from the film that has quite an impressive cast that includes Jason Clarke, Josh Brolin, Jake Gyllenhaal and John Hawkes as climbers facing the titular monster mountain that has claimed many lives. 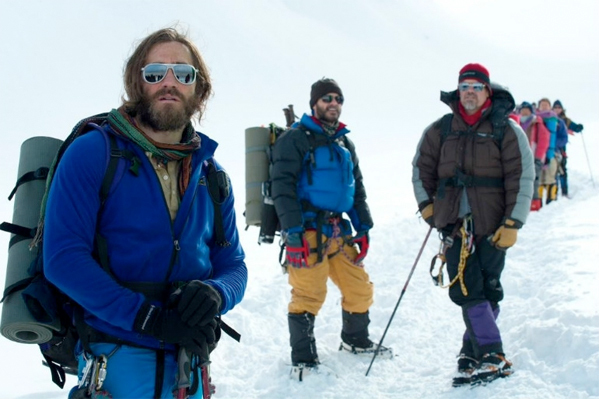 Now a new photo has surfaced from the film with Gyllenhaal as the most prominent climber. And while I'm pretty sure that's Brolin on the far right of the image (see it below), it's difficult to decipher just who is standing next to him. Look below! Check out the first photo from Baltasar Kormakur's Everest with Jason Clarke right here. Everest is directed by Baltasar Kormakur (Contraband) and written by Mark Medoff (Children of a Lesser God) and Simon Beaufoy (Slumdog Millionaire, 127 Hours). The film follows a treacherous attempt to reach the summit of the world’s highest mountain, documenting the awe-inspiring journey of two different expeditions challenged beyond their limits by one of the fiercest snowstorms ever encountered by mankind. The climbers (Jason Clarke, Josh Brolin, Jake Gyllenhaal & John Hawkes) face nearly impossible obstacles as a lifelong obsession becomes a struggle for survival. Universal releases the film September 18th, 2015. Jason Patrick in the middle? The casting director(s) seem to have a thing for casting actors with "J"s in their first name initials, so why not have another one (and another Jason to go along with Clarke). Looks cool. Everest films are always really sad and inspiring. There was K2 now there J4!